Quarryville has always been a crossroad of activity in the fertile farmlands of Southern Lancaster County. Farmers purchased lumber, grain, and fertilizer here and reciprocally exchanged their bounties in town and beyond via the local county railroad, a lifeline to the outside world. Commonly known as the Quarryville Branch this rail line had an interesting early history that started with big hopes and ended with financial disaster. The Lancaster & Reading Narrow Gauge Railroad was chartered in 1871 to build a narrow gauge network between Safe Harbor and Reading via Lancaster including a branch to Quarryville, competing directly with the neighboring Reading Company subsidiary the Reading & Columbia. Before construction commenced it was decided to build the line to standard gauge instead, but the Panic of 1873 quickly stalled progress. Falling into financial distress, the Lancaster & Reading Narrow Gauge Railroad was ironically leased to the Reading Company becoming an extension of its Lancaster Branch, part of the R&C. With the contract secured for the branch to Quarryville, the Reading looked to another opportunity, the potential of connecting with the B&O mainline by extending south from Quarryville to Elkton, MD, a move that would involve the financially strapped narrow gauge railroad the Lancaster, Oxford & Southern. When presented the idea of becoming a bridge route, the LO&S optimistically commenced plans to build new extensions on its existing route including a new line to Quarryville, with the intention of everything being converted to standard gauge. Once complete perhaps the small common carrier would see financial success or even be purchased at a profit by the Reading or the B&O. The plan, however, began to crumble when the Lancaster & Reading Narrow Gauge Railroad defaulted on their mortgage, rendering the Reading lease null and void, and the property went up for auction in 1900. At the Philadelphia Stock Exchange, a tense bidding war played out between extended representatives of the B&O, Reading Company and PRR. Charles H. Locher, a Lancaster businessman, minor shareholder of the L&RNGR and friend of the PRR attended the auction, outbidding the competition and thus protecting their coveted territory by eliminating the plan for the competitor's line once and for all. Regardless the LO&S completed the branch to Quarryville but the hopes for financial success or being converted to standard gauge were never realized, the railroad toiled in bankruptcy through 1910 scrapping its Quarryville Branch in 1917 with the rest of the railroad ceasing operation the following year. While the drama of railroad barons and hopes of back-road competition unraveled, another chapter in railroad history was playing out in the small town. The PRR commenced construction of the new Low Grade route across Southern Lancaster County. 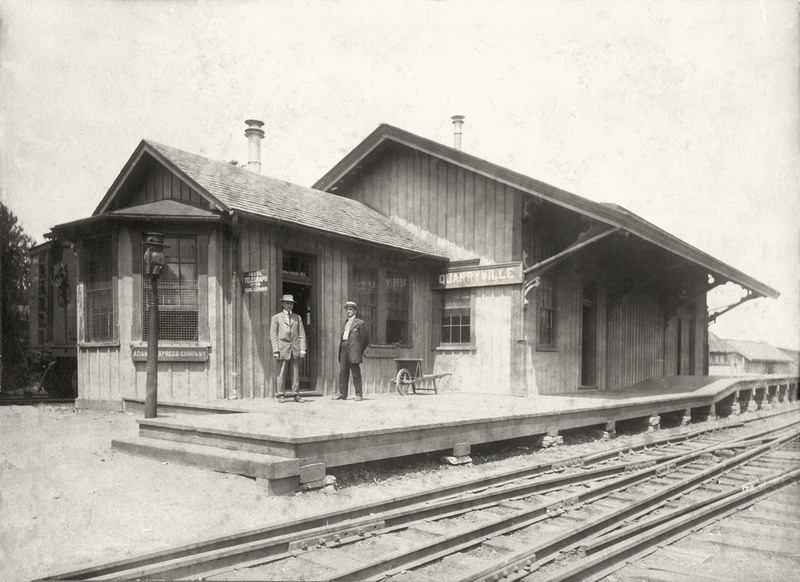 Situated at the approximate center of the eastern segment of the new Atglen & Susquehanna Branch, Quarryville was the epicenter of construction and staging between 1903 and 1906. Despite the building of the new line, it was very evident that the PRR had no intention to tap the small agricultural market with any additional resources other than the branch it maintained from Lancaster. When construction was completed the A&S cut through the Borough on an elevated fill with little more than a water stop, a telephone box and overpasses over its branch and another on Church Street. Pennsylvania Railroad track chart showing the grades and curvature of the former Lancaster & Reading Narrow Gauge Quarryville Branch circa 1940. For the next half a century the railroads continued to operate separately from one another. As the PRR entered its final year's maintenance on marginally performing branches were often deferred, and the Quarryville Branch was certainly no exception. Entering the Penn Central era, with finances already tight, management looked to shed money-losing lines; the Quarryville Branch made the short list when the Penn Central petitioned the ICC for the abandonment of over 138 line segments in 1971. Making matters worse the branch suffered an even greater blow in 1972 when it sustained significant damage from Hurricane Agnes placing most of the branch out of service. Regardless, the shippers in Quarryville rallied, seeking a deal with Penn Central, who had estimated that a 1700’ line connection to the A&S would come with a price tag of $130,000 a burden the broken railroad could not afford. Shippers agreed to pay the cost of construction, and the PC withdrew 2.26 miles from the ICC petition, saving the most lucrative piece of the branch and rail service to local shippers. Finally, after 67 years of trains flying over the town, Quarryville had a connection to the A&S, but that too would only last another 15 years.